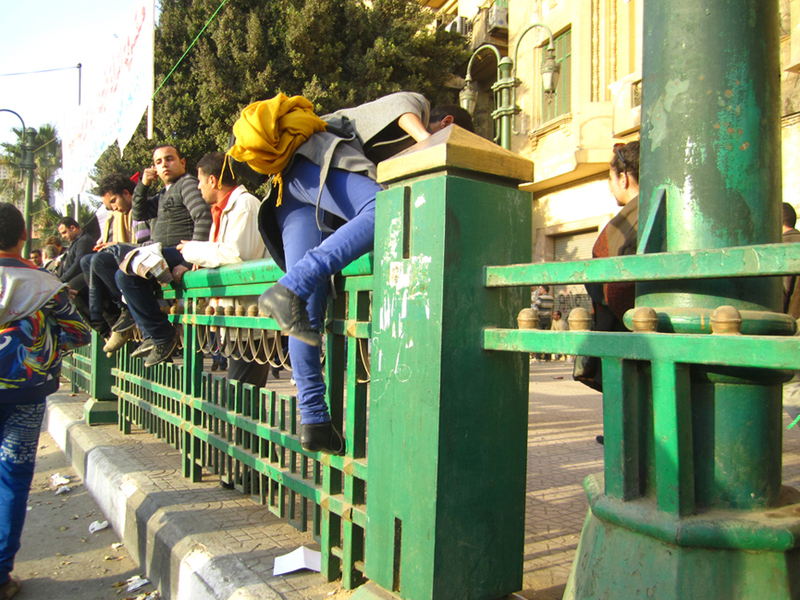 Ubiquitous metal barriers are fragmenting Cairo's public space. 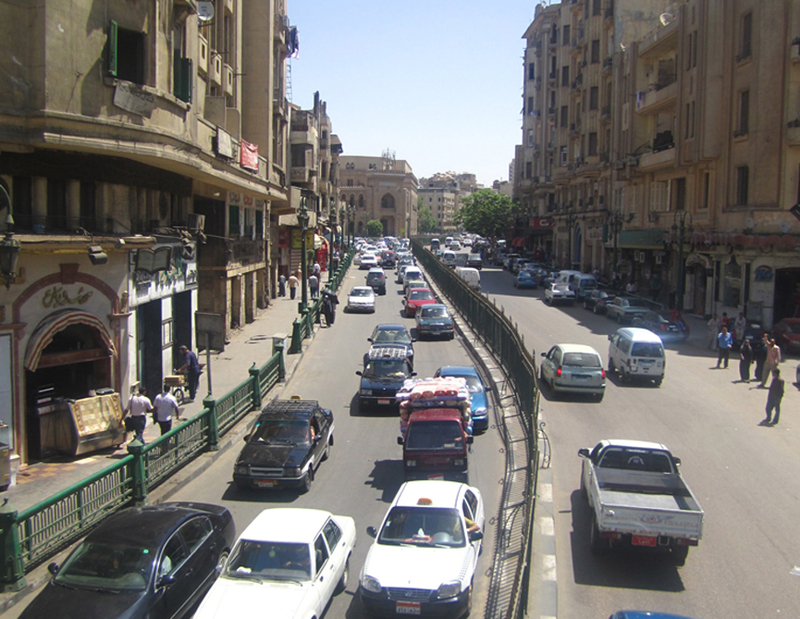 Bulky metal barriers over a meter in height line Egypt’s major squares and avenues. They are painted green with gold accents as to make the barrier’s grotesque presence appealing. 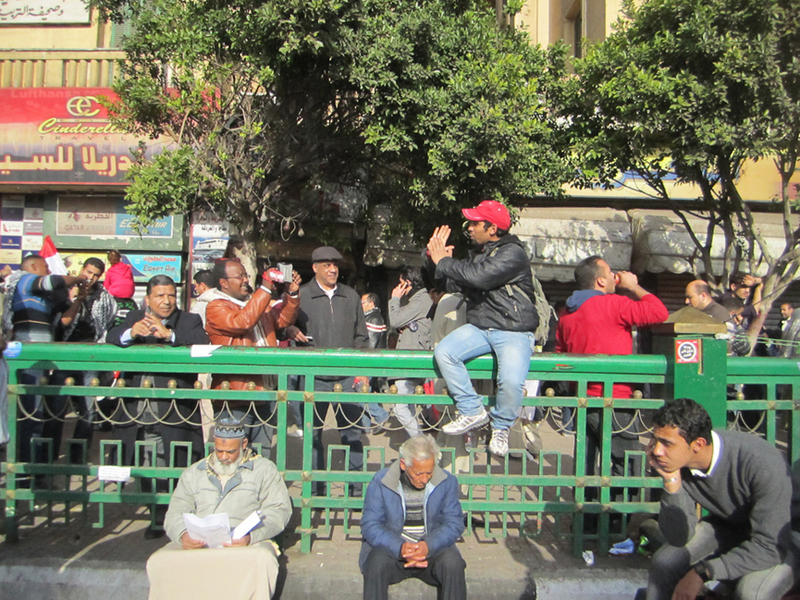 These walls circumventing Egyptian public spaces reveal the way the state perceives its denizens as mere herds. The assumed reason for the existence of these walls is to control traffic by blocking pedestrians from crossing streets at major intersections at random. This is an urban myth however, as no official statement can be found to corroborate the reason for these militarized interventions in our cities. From Alexandria in the north to Aswan in the south every city is graced with meters upon meters of bulky metal walls. The green walls can be read as symbols of the state and as markers of its hegemonic presence, distinguishing little between regions. However, education, health services and proper housing, which could all be potentially indicators of a strong state, fluctuate from city to city and region to region in Egypt, but the green walls are consistent. The state that placed these walls is a failed state. The walls began to appear following major protests led by students against the Mubarak regime’s complicity in the invasion of Iraq. It may be a coincidence that the walls were not necessarily a direct response to protests that took place in open public spaces. However, the walls divide public space into an archipelago and make it difficult for masses to move freely. Pedestrians find themselves sometimes locked out of the sidewalks so they walk along side them on the roads, competing for space with cars. The walls also have created dead spaces in the middle of major squares. Those dead spaces were also places of death during the violence between protesters and the security forces during the revolution, when some protesters found themselves trapped behind the walls and were beaten to death. The walls are also evidence in plain sight of the scale of corruption in the Egyptian state. While basic services are lacking and a majority of the population lives in poverty the state spent millions of dollars and wasted resources on kilometers of steel walls painted green and gold. Because of their pervasiveness the walls have become a normal and almost invisible feature in daily life and most people have become accustomed to walk around them. Unlike the concrete block walls the military erected over the past two years around the parliament and other institutions, there is a sense of permanence regarding the bulky green walls, which has made them an acceptable element of the Cairo’s urban streetscape. Egypt’s Berlin Wall moment will come when the failed architecture of the walls in the streets of Egyptian cities and the state logic that produced them are forever removed. Mohamed Elshahed is a Cairo-based researcher currently writing his doctoral dissertation on mid-twentieth century architecture and urbanism in relation to Egypt's political transition. He is the founder of Cairobserver.com and tweets about Cairo.